Local school districts are ramping up awareness of the dangers of electronic cigarettes, holding forums and sending literature home to educate parents and students. With the use of electronic cigarettes surging among young people, more Long Island school districts are sounding an alert about “vaping” and strengthening consequences for students caught on campus with the devices. “This is kind of a fairly new phenomenon — probably in the last year and a half — and these things came out of nowhere,” said Randy E. Rusielewicz, principal of Patchogue-Medford High School. Parents, educators and lawmakers said it is a challenge to stem use among teens. To combat the practice, some school districts are holding public forums and sending literature home to educate parents and students about the dangers of e-cigarettes and the devices that deliver vapor. Lawmakers in both Suffolk and Nassau counties have enacted legislation restricting sale of the devices to those under 21. And, a Hauppauge-based company has developed a system that detects vapors in school areas, such as bathrooms, and sends alerts to school officials. E-cigarettes allow inhalation of an aerosol that usually contains nicotine, flavorings and other chemicals. While the battery-operated devices can resemble traditional tobacco cigarettes or cigars, many look like common items such as pens or USB flash drives, which is particularly troublesome for school officials. For example, the use of JUUL e-cigarettes, which look like a USB drive and come in sweet flavors, such as cotton candy and creme brulee, has exploded among minors. A state Health Department survey released in March 2017 showed that use of “electronic nicotine delivery systems” among those of high school age nearly doubled from 2014 through 2016 — even as the number of cigarette smokers in that populace dropped 84 percent from 2000 through 2016. Gov. Andrew M. Cuomo in July 2017 signed into law a bill immediately banning e-cigarettes in buildings and outdoor grounds of schools from preschool through high school. The law also bans the use of e-cigarettes in any vehicle that transports children or school personnel. The U.S. Food and Drug Administration last month called vaping among youths an “epidemic” and has threatened makers and sellers of e-cigarettes if they don’t curtail sales to minors. The FDA gave the five largest e-cigarette manufacturers two months to produce a plan to keep their products out of the hands of youths. More than 2 million middle and high school students were users of e-cigarettes in 2017, according to FDA estimates. Officials in the e-cigarette industry said their mission is to provide adults with an alternative to traditional cigarettes. At a public forum on vaping Wednesday night at Patchogue-Medford High School, Suffolk County Senior Drug Abuse Educator Stephanie Sloan showed parents a variety of e-cigarette devices, explained the dangers of chemicals associated with e-cigs and some of the marketing techniques behind them, including clever packaging. “They certainly know what they are doing to get young people to use the devices,” she said. Parent Danielle Zumpol of Medford, who has two sets of twins, one in seventh grade and another in 10th, said she found the presentation informative. In May, Nassau County lawmakers approved a bill requiring retailers to keep e-cigarettes and other vaping products behind the counter in an effort to discourage young people from using the products. Nassau County Legis. Laura Schaefer (R-Westbury) said the county took the step as vapes and paraphernalia associated with them were openly marketed to young people. “So many people have quit smoking, but this was marketed differently — the ‘in thing’ to do. And it is still dangerous,” said Schaefer, a member of the legislature’s health committee and chairwoman of the environmental committee. Patchogue-Medford 10th-grader Dominic Liriano, 15, said vaping among teens is very popular. New York City-based grass roots group Parents Against Vaping is in the midst of a letter-writing campaign to the FDA, asking officials: “Why wait even one more day? Each day that passes brings us one step closer to having an entire generation of kids addicted to nicotine! We implore you to regulate e-cigarette companies like JUUL and ban all flavors and online sales immediately,” read the group’s letter. Jim McDonald is a Michigan-based editor at the online site Vaping360, started in 2014 with the goal of helping smokers switch to a cleaner alternative. He said vaping helped him quit smoking after 38 years, and he believes the controversy about e-cigarettes is overblown. Disciplinary action against students using e-cigarettes on campus varies by school system. The Patchogue-Medford district has a zero-tolerance policy, meaning students caught with the device face five days of out-of-school suspension and a superintendent’s hearing. In addition, Rusielewiczsaid there is the possibility the devices can be used to “vape” cannabis oil, so whatever is confiscated is sent to local police for analysis. It was the interest from schools that led a local entrepreneur in Hauppauge to create a detector to be used in school bathrooms or other areas where cameras are not allowed. 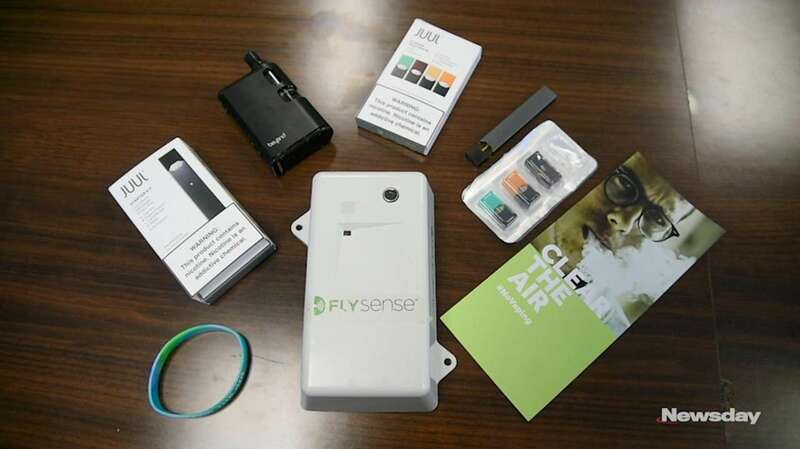 The Fly Sense 2.5 is a cloud-based platform with hard-wired sensors that detect and send alerts to school or workplace officials when vaping or other potentially harmful incidents are taking place in bathrooms or isolated areas, such as locker rooms. The sensor, which looks like a small box that could hold an automatic air freshener, can detect anomalies in the decibel level typically associated with bullying or chemicals from vaping. It sends an immediate notification to officials’ computers or mobile devices. The device, originally created to give the alert of bullying in bathrooms, has found a market for vape detection. Orders have come in from about 23 states, as well as Canada. South Side High School in the Rockville Centre school district is in the process of installing the devices. The move is “one part of the district’s response to this very serious epidemic, and the steps we are taking to keep students healthy and safe,” Principal John Murphy said. Bossert said many school districts have updated their codes of conduct to reflect e-cigarette use in the way they would handle tobacco use. In the Longwood district, the staff, nursing and mental health professionals have been trained about the rise in vaping, and the health curriculum in kindergarten through 12th grade has been updated to reflect education on vaping. Information on the dangers of the use of the devices have been shared with students and parents. Correction: A state Health Department survey about “electronic nicotine delivery systems” was released in March 2017. Due to an editing error, the date was incorrect in a previous version of this story.